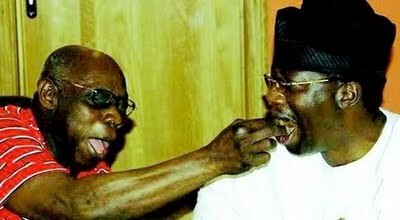 Romeo and Juliet aka Obasanjo and Gbenga Daniels, when the going was good.Only God would help me oh with where i find all these things,ha,am tired of laughing oh! no permanent friend, no permanent enemy...even sef interst no dey permanent. this OBJ no dey fear sef, what happen if Daniel in the Lion's den bite his finger and said...."sorry sir, mo mistake ni?" politics??? ?...money for hand... conscience for pocket!